I was sitting in my 6th grade daughter’s reading classroom during Open House. It was 7 pm, I was cranky because I hadn’t had time to eat a proper dinner, and I couldn’t focus on what we were being told. I let my eyes wander. They fell on a chart the teacher had put on the whiteboard that day. 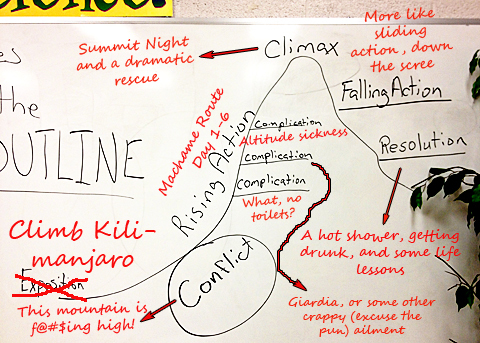 Clearly, it was an outline for expository writing, nothing out of the ordinary from a reading teacher. But the way he had visualized it by drawing a mountain, with the action first rising, reaching the climax, and then falling again, got me so excited I almost jumped out of my seat. What I had there in front of my very eyes was nothing else but the profile view of Kilimanjaro’s Machame Route, which I trudged up so laboriously the first week of September 2012. I could practically see the toilet challenges, the sickness, and the other pitfalls, right where the teacher had thought it appropriate to remind his pupils to add a series of complications. When the bell finally rang and we were allowed to leave, I went up to the teacher and asked for permission to take a picture of his chart. I was so pleased with making this connection that I started telling him about it, but – considering he was a reading teacher – he displayed a disappointing lack of interest. I’m not sure he would have given my book a good grade. But I didn’t care. I had the perfect diagram for this blog post. This, basically, is the synopsis for Kilimanjaro Diaries: Or, How I Spent a Week Dreaming of Toilets, Drinking Crappy Water, and Making Bad Jokes While Having the Time of My Life right there. Maybe I should put that on the back cover instead of the blurb. By the way, making the story into a book is like climbing a mountain all over again, especially if you self-publish. But that’s a story for another day. Next Upcoming: Book Signing at Parnassus Books in Nashville! Eva: I just now today finished reading your excellent “Kilimanjaro Diaries” book. I myself leave a month from tomorrow for my own Kilimanjaro trek. Over the past year of preparing for my trip, I’ve read countless Kilimanjaro articles, blog posts, books, etc. And by far, yours has been the best. You had me laughing on many pages. But I was welling with tears on others, especially during the climactic scene on the summit night when your son… well, I shouldn’t give away the details so I don’t inadvertently spoil the “plot twist” for someone who hasn’t read the book yet. Your book has inspired me to make sure my outfitter carries a private toilet up the mountain! (ha!) I applaud you for your Kilimanjaro journey, and I applaud you also for writing this book. I thoroughly enjoyed it. By the way Bryan, I always love new reviews on Amazon, if you don’t mind taking a few minutes for one. No problem. I just posted a review on Amazon. I’ve recommended your book to a variety of friends and family, as it’s a well-written story of a great expedition, regardless of whether the reader is preparing for his or her own Kilimanjaro climb. Once again, best of luck for your climb, and like I said, I’d love to hear about it when you come back. Michael – thanks so much for sharing your story! I love it when prospective or past (or, in your case, both!) climbers read my book and get something out of it. It must have been so disappointing to have to abort at Shira Hut already but there is no arguing with severe AMS. I am so glad you’re returning to give it another try. I was just asked at my book signing last night whether I would climb again, and the answer, unequivocally, was yes!